Welcome to the Cloth Diaper Must Have’s Giveaway! Sponsored by Eco Nuts, Spray Pal, Diaper Dawgs, Figgy Fuzz, Molly’s Suds and Maxwell Designs. 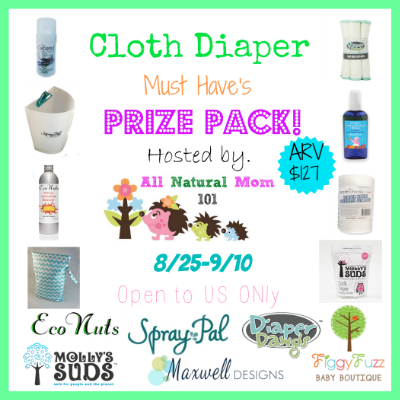 One lucky reader of Tales From A Southern Mom and AllNaturalMom101 will win a Cloth Diaper Must Have’s Prize Pack. Prize pack contains one(1) pack of Diaper Dawgs Heavy Dooty Cloth Wipes, one bag of Molly’s Suds Cloth Diaper Detergent, one Spray Pal, one bottle of Eco Nuts Ammonia Bouncer, one Maxwell Designs Wet Bag, one pack of Applecheeks disposable liners, one bottle of Kissaluvs Diaper Lotion Potion and one Eco Sprout Coconut Stick. Check out All Natural Mom 101’s top 10 favorite cloth diaper must have’s HERE and enter the giveaway below. I love wet bags. They can be used for so much more than just diapers. I love flushable/disposable liners! They’re great for those who don’t have diaper sprayers. cloth wipes save so much money! With two toddlers in diapers! Things can get very expensive when using disposables! Cloth wipes! I was using disposable wipes for a while and I had to have two trash cans next to the changing table. It is so much easier to toos the cloth wipes in with the diapers. Wet bags. One for the home and one on the go!